The National Hurricane Center issued its last statement on the remains of what was once Hurricane Danny this morning. 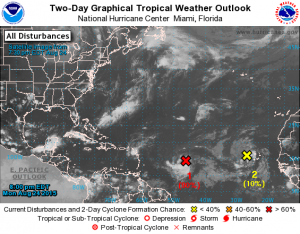 Danny hit an area of cooler ocean temperatures and strong wind shear which shut down convection in the storm, leaving just a remnant tropical wave which is not expected to redevelop, although it could bring some rain to drought-stricken Puerto Rico and perhaps even Florida. The shear is related to the strong El Nino occurring in the eastern Pacific Ocean and is expected to affect developing storms throughout this season. So now eyes turn east to the next tropical wave in line. 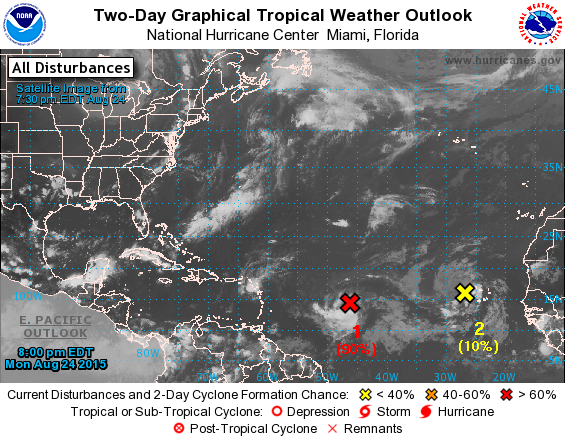 The NHC gives this one a 90 percent chance of developing in the next 48 hours, so it would not be surprising to see it designated Erika by morning. Almost all the forecasts for this storm so far have it recurving to the northeast without hitting land, so the most we are likely to see from the storm, if it survives the shear, is some high waves along the Atlantic coast. UPDATE: As of 11 pm, Erika has now officially formed in the Atlantic. You can follow information about this storm and others at http://www.hurricanes.gov or http://www.spaghettimodels.com.